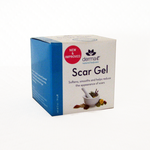 Derma E Scar Gel softens, smooths and helps reduce the appearance of scars. A unique blend of botanical extracts in this greaseless, pleasant smelling gel softens, smooths and helps diminish the appearance of scars. Excellent for scar tissue, stretch marks, calluses and other skin hardenings. Allantoin and panthenol help heal, rebuild and add suppleness to your skin. Onion extract allicin is antibacterial, antifungal and antiviral. Water aqua, allium cepa onion bulb extract, glycerin, allantoin, panthenol, carbomer, beta-alanine, phenoxyethanol, ethylhexyglycerin, lavendar fragrance.